The Jax and Gia series is now available as a motion picture adaptation with Passionflix, a new streaming service that is similar to Netflix but specializes in romantic films and original programming. Purchase the movie through Amazon (available in the U.S. and U.K. only). Subscribe to the Passionflix service. Once you’ve subscribed, you can download the app (iOS or Android) to access content. International readers can subscribe to view Passionflix-produced original films, such as Afterburn Aftershock. At some point in the future, Afterburn Aftershock will be available for individual purchase or rental outside of Passionflix in streaming stores like iTunes, as well as on DVD. Unfortunately, we don’t know when that will be at this time. Subscribe to SylviaDay.com News to be notified when non-subscription viewing is available. And don’t forget to sign up for SylviaDay.com News to stay up-to-date! This is the most up to date information on this topic as of April 2019. 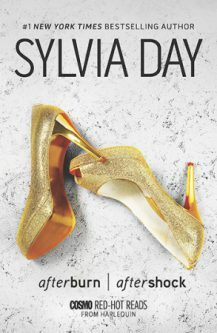 Subscribe to SylviaDay.com News and Sylvia's Newsletter to receive any updates to this information.